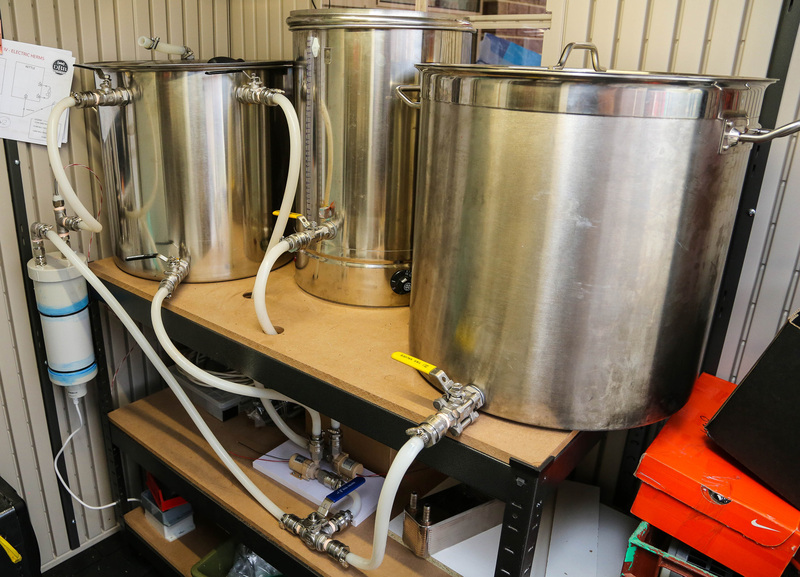 It’s another long weekend here in Canberra and so more work continued with the brewery today – this time the plumbing. Although I only got in here a few hours today, the plumbing is almost complete with the exception of mounting the pumps, three-way tap and plate chiller. I decided on two of the 12v little brown pumps – I guess we’ll see how good they are, for $25 each I’m not to fussed if they pack it in and I need to go bigger later on. Wanting to change hoses as little as possible (and despite them all having quick-release connections) it has been set up with everything connected, the only hose I should need to disconnect on brew day is to the kettle for draining into the chiller then fermenter. With most of it complete now, it leave the electrics which I’ll do further planning and construction over the next few days/week. My biggest hurdle is only having a 10amp circuit to work with and three elements. I think I’ll wire each element with it’s own power switch so I can flick between them, it may make the brew day a little longer but at least it won’t blow the house but then it future proofs me for when I do have a house with a dedicated larger amp circuit. I’ll also work out a quick way to properly fix the three way tap down as well as the plate chiller which I am planning to mount to the front right-hand leg of the table. We’re almost there with the 46 litre brew house!